A very temperamental person. 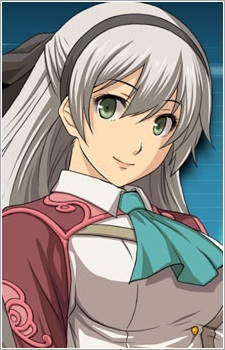 Elie is the granddaughter of Crossbell City's mayor who joins the police force for a mysterious reason. Well versed in politics and economics, and one of the representatives of Crossbell's Autonomous Region. She has an honor student-like personality. She is skilled with firearms, and is adept with the Wind element. Elie utilizes an old fashioned orbal gun that can transform into an orbal rifle as her main weapon. The reason she joined the police force is because she cannot affect anything as a politician because they are restricted by various outside influences. As such, she was assigned to the SSS under Lloyd. She loves Crossbell greatly and joined the police force after returning and seeing the distorted state of Crossbell. An exemplary person who excels at many things, she passed the tests to become an investigator with flying colors.